Thank you so much for your interest in becoming part of our team. We are searching for called and qualified individuals to enhance the ministry at Riverside Regional Jail, and join the 75 ministry volunteers already giving 350 hours monthly to provide religious services to inmates & staff at Riverside. The Chaplain directs the religious services to the inmate population at Riverside. Services consist of both individual ministry and group religious activities. 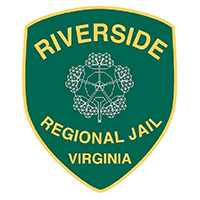 There are a number of ongoing services and special events available to the inmate population. The right to religious expression is held by the inmate, and as such, ministry is shaped around the spiritual needs as requested by the inmates. The objective is to provide the highest quality of religious services as requested by the inmate population. This requires careful screening and proper training of ministry volunteer applicants to ensure each person is a proper fit and well trained in meeting the spiritual needs of our inmates. We welcome the opportunity to explore with you where God might use you in this ministry. Please refer to the information below that explains available areas of ministry. If you would like to pursue opportunities for ministry at Riverside, please submit the completed Chaplain’s Informational Form (both sides). 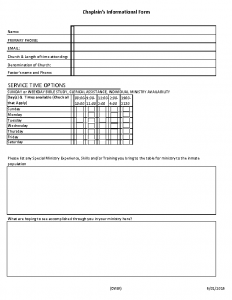 Upon receipt of the completed form, the Chaplain will contact you to further discuss how you might be involved. Lead group religious services, provide music for Worship Services, teach a biblically based Life Skill class, assist with distribution of religious materials to the inmates, assist in the Chaplain’s office with clerical tasks associated with providing services to the inmates. If you are not ready to minister directly to the inmate population, but would like to be a part of the ministry, there are many support roles for you that will help ensure those who do come inside are able to carry out ministry. There are clerical needs in preparing and following up on the more than 75 volunteers who carry out 40-plus activities weekly. There are community events sponsored by the Chaplain’s office to raise awareness and support for the ministry. Perhaps you feel called to help us further introduce Good News Jail & Prison Ministry to the cities & counties served by this jail. The Chaplaincy Support Team is a way to do so. The desire of the Chaplain’s office is to assist inmates to connect/re-connect with a local congregation. For that reason, professional courtesy is extended to those ministers serving a local congregation regarding visiting inmates to reconnect them with your local congregation. By showing proof of your position as the minister of a local body, and that you understand and agree to follow the rules for clergy visits – you can be granted non-contact clergy visit privileges. To inquire about this privilege, contact the Chaplain’s office.